The AOC G2460PG is one of the first G-Sync monitors on the market. It’s a gamer friendly screen that is capable of running at 144hz, which is as fast as you could possibly want! It is also compatible with the Nvidia G-syn adaptive syncronisation technology which is designed to give you a smooth tear free image. 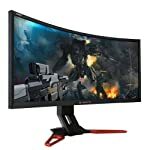 This is especially useful if your graphics card isn’t able to keep up with 144 frames per second, the monitor is able to slow down and accept frames as and when the card makes them available. This ensures a consistent clear image during fast action sequences. 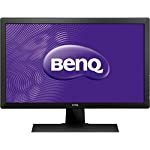 The G2460PG is a traditional 24″ full HD monitor and whilst many manufacturers are producing bigger screens with higher resolutions there are still many who will want to stick with this common format. It fits well on a desk, the HD resolution won’t present you with awkward scaling issues and 24″ is actually a great size for working and game playing – anything too big sat a few inches away on a desk can be hard to take in. But each to their own, only you can decide whether this is your preferred screen format! 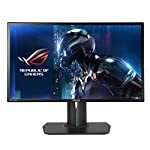 It’s worth mentioning right away, this monitor only has a single DisplayPort adapter so you’re going to need a modern graphics card to hook it up, but most likely, if you are looking for a G-sync compatible screen, you already have a modern Nvidia card with a DisplayPort socket built in. But if you want to rig it up to that XBox sitting under your desk I’m afraid you’re out of luck. Fortunately there are USB 3.0 ports so this AOC does score some points for connectivity! This is a G-Sync monitor, hook it up to a compatible Nvidia card, turn it on (remember to ensure games aren’t running vsync) and then prepared to be amazed at just how smooth games not look. Any change to the frame draw rate is unnoticeable and you are left with a tear free image. You can also switch to ULMB, the blur reduction technology, you lose some brightness but get sharper images. This can’t be used at the same time as G-Sync so you’ll want to experiment with which to use when. Reviewers have shown that the AOC G2460PG isn’t a top scorer when it comes to colour accuracy, but that’s OK, it’s good enough for gaming and that’s why you are buying this screen! Once you are in possession of this monitor you can always look up some calibration profiles online and once configured you’ll be able to get a better setup compared with the out of the box experience. Responsiveness and input lag are both super low so just right for even the most sensitive gamers. We give the AOC G2460PG a 4 out of 5 rating. Want to know what existing owners of the monitor think? You can read real user reviews here. 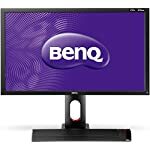 Should I buy the AOC G2460PG? G-sync, a 144hz refresh time, low input lag and fast response times all make this a good gaming monitor choice for you gamers out there. If you are having some doubts about this purchase then why not read some real owner reviews and see what other buyers think. 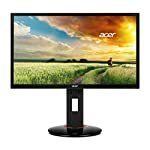 Welcome to the AOC G2460PG FAQ. This section attempts to answer common questions you may have, please get in touch if you have any more queries or if you think our answers need updating. Does this monitor come with a HDMI cable? No, and seeing as it has no HDMI port, it would be silly if it did! But to answer the next question, it does come with a display port cable and power cable.